This morning my friend, Eric, and I disassembled and put away the RZ96. I thought, for the heck of it, why not try to wear the long bag as a backpack? Pouch has backpack shoulder and waist straps sewn onto the bag. On its face, it looks like a stupid idea, a bad joke that the average reasonable person would expect might foreseeably lead to customer injury and product liability lawsuit. Shoot, maybe I could wind up owning the folding boat company? Who knows what a European Union court might decide in the event I snapped my spine trying to carry the embagged boat half? Once I struggled into the backpack, having set it on a rusty lawnchair to make the process a little easier, it was no problem to carry and walk about with. So I was wrong, it was not just some bad joke by sewing machine. On the other hand, I never did try it with the smaller, but equally heavy, hullskin bag attached. That would have been foolish, and, as the photographs illustrate, I'm a very serious guy. in the event I snapped my spine trying to carry the embagged boat half? On the other hand, I never did try it with the smaller, but equally heavy, hullskin bag attached. http://www.poucher-boote.de/index.php?rz96&L=1 . Everybody else simply gives a stripped weight. You can carry 43 lbs narrow package. Sometimes it is painful (literally) when there is sharp or angular piece next to your spine. 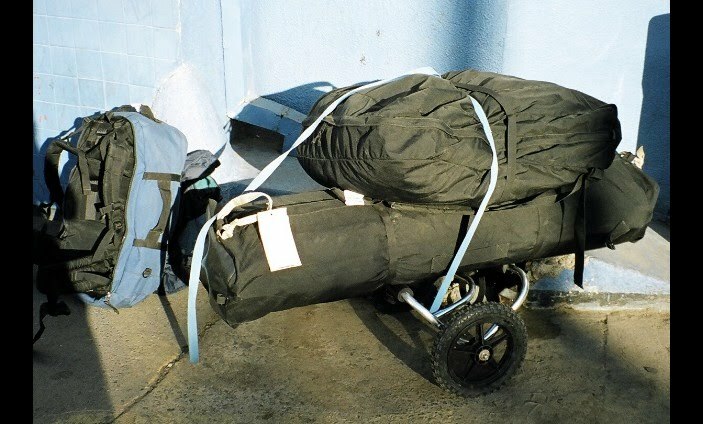 When I traveled with MK1, I put blue 6 ft foam sleeping pad at the frame bag bottm, length-wise, and folded the ends up. The bigest problem is to lift it - not to carry it across flat terrain. But be careful when turning or stopping - this high center of mass controlls you, and not vice versa. Carrying 43 lbs of shapeless skin bag is actually more difficult - it hangs down and back behind your shoulders, and doesn't feel good. That's why I said once that considered it a lame joke by Folbot when they claimed (or suggested) to "toss it [Citibot] over your shoulder" and hop into the bus or train. Yeah, yeah... In commuter train or bus, in the city - if I got the joke right. Same 40+ weight, including daypaddle gear. I didn't enjoy this sport, especially when it was hot, and have come up with some soltuions, like this one . The boat is MK1 (2 black bags). Ribs are in carryon blue backpack. The cart is by Paddleboy, I only replaced the wheels and attached blue straps. You can also see blue carrying handles at the ends of the frame bag (my mod - Longhaul didn't provide this), but you don't see backpacking straps - they are detachable and I left it home, eventually deciding that would use a cart. But is still was pain to move all this even over flat short distance like US/MEX border bus crossing. FC allows much more compact and much lighter travel, - big difference. But again, I wouldn't enjoy carrying FC backpack, even with a small boat like Kahuna - only over very short distance and very smooth terrain. Earlier this evening, upon arriving home from work, I took the household scale (that my wife bought me at Christmas to as an 'encouragement' to stick with Weight Watchers) out to the boat shed. First, I weighed myself - in work clothes and boots, 170.4 pounds. Then I got into the long bag's shoulder harness, hefted same onto my back, and weighed - 226.4 pounds. While I was out there, I grabbed up suitcase-shaped bag, and stood with it on the scale - 220.4 pounds. So the long bag weighs about 56 - somewhat less than I'd reckoned - and the suitcase bag bout 50 for a total of 106 pounds. Still about 20 pounds less than I thought, but more than the Pouch website claims for the boat's weight. There're definitely times when I don't enjoy kayaking, generally, and my wood-framed folders in particular. Weight and awkwardness of the embagged boats has been a part of that. Sometimes it's just miserable slogging against the wind. the long bag weighs about 56 - somewhat less than I'd reckoned - and the suitcase bag bout 50 for a total of 106 pounds. Still about 20 pounds less than I thought, but more than the Pouch website claims for the boat's weight. I wonder why there is still such a big discrepancy after they've added bags, seats etc. Extras/options like keel strips may be? But they only add 4 or 5 lbs (6 lbs in Klepper 2 Exp). My bathroom scales lie often - depends where I stand on the platform, and they don't like very heavy loads - over 220 lbs of me with some bag. The previous one was so inaccurate that I had to throw it away. Current scales have about 3 lbs accuracy if doing accurately and averaging. Weigh the bag without yourself. Support it from the sides with hands not really touching, but holding hands close to stop it from falling to either side. It will try and fall to one side - you hold it, it tries falling to to another side etc - and note the maximum value when it crosses the unstabile centered position. Could be different from what you've got.